Chinese cuisine is wonderful. I love going out to eat in Hangzhou. Why it makes me more susceptible to gout here than at home, I cannot say. I’m not going to stop eating Chinese food, so I’ll just have to be careful. This is a problem I don’t want. Two years ago when I was in Hangzhou, I had a couple of bouts of gout. This is the condition known as “the disease of kings” or “the rich man’s disease.” It was so called because the condition was believed caused by the diet of rich foods available to the wealthy. Gout is a nasty disease that often manifests itself in the big toe most of the time, but it can afflict other joints as well. It makes your foot look like it has a bright red bunion. Big toe gout is called podagra. I felt the first tingle of an oncoming gout attack during the night, and I resolved to head it off. What is it about Chinese cuisine—in China—that seems to promote it in me? Two years ago, I was rendered unable to walk for two or three days. I hobbled around the apartment in extreme pain. Took about two weeks to dissipate. This never happens in Minnesota. Why wasn’t I told about this when I went to the travel clinic for my immunizations? The nurse used my arms for pincushions while I was there. I thought I had been vaccinated for everything except the common cold and heart attacks. All food has purines. Ergo, all food causes gout. Just about. Take a look. How would you adjust your diet? Meat—avoid all organ meats—they have the most purines. Not hard to do. However, also avoid or eat only in limited amounts: pork, chicken, duck, goose, ham, rabbit, sheep, turkey, lamb, veal, and venison. What did I not mention? Also, avoid gravy, bouillon, and chicken soup (even though it’s good for the soul). 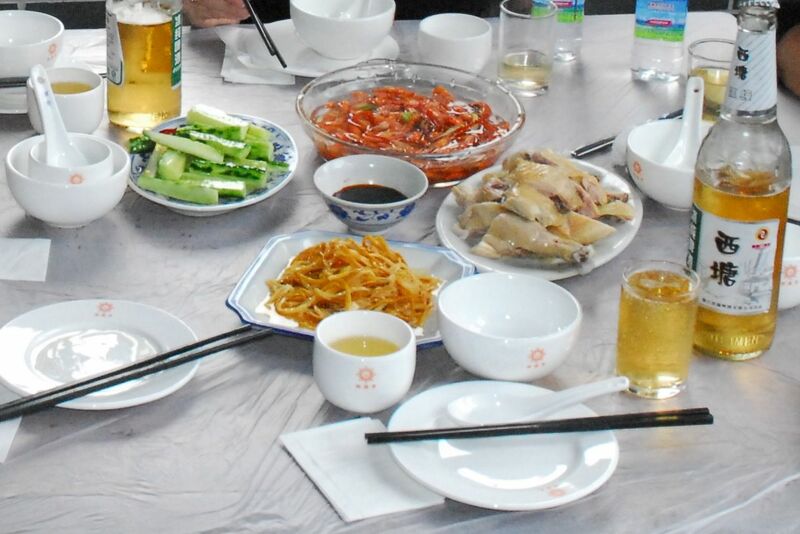 Ever heard of Chinese cooking without pork, chicken, duck, sheep, and lamb? Seafood—no scallops, sardines, herring, anchovies, and mackerel. They are the worst fish with respect to purines. (There go the dinner parties, lunches, snacks, and pizzas.) Only small amounts of oysters, lobster, crab, and shrimp. Only moderate amounts of tuna, carp, codfish, halibut, perch, salmon, snapper, and trout. Ever heard of Chinese cooking without fish? Grains—no oatmeal! It’s one of the worst purine offenders. Same goes for wheat germ, bran, whole wheat breads and cereals. Instead, eat white bread, pasta, and rice. Sugars—these aren’t so bad for gout, but are bad for other conditions, such as obesity and diabetes. Prefer fresh fruits. No more half-and-half and sugar at Starbucks. Vegetables—no more than two servings per week of asparagus, cauliflower, lentils, beans, peas, spinach. Ever heard of Chinese cooking without vegetables? We grill asparagus all summer long. I make a wonder, spicy Chinese cauliflower preparation. I make International Red Lentil Soup by the cauldron. Alcohol (Beer in Particular)—this is not good. Beer is the worst for gout because of brewers yeast. Other alcoholic beverages are not as bad, but can contribute to gout. According to Healthline.com, “Studies have shown that drinking beer during a gout attack can significantly increase the intensity of symptoms. Excessive alcohol use (more than two drinks per day for men or one drink per day for women) can increase risk of a gout attack. “ This is really, really bad news. I’m so depressed. I’m going to have some non-alcoholic water and some grass.